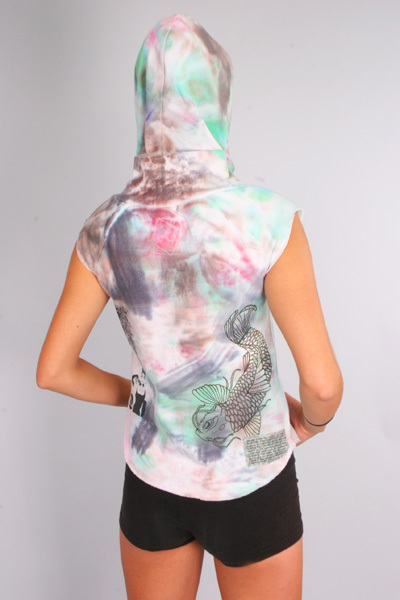 Limited run one of a kind Extra cowl neck soft eco-fleece poly-fur lined sleeveless hoody with comfort lined pockets, custom dye, Hindu Goddess and Koi Art. 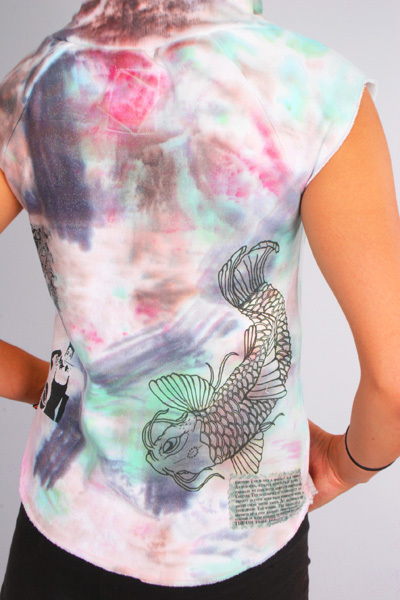 Be sure to enter the dye color choices you would like us to hand dye in a similar fashion as seen above. Artistic inconsistencies make every reproduction unique and yours. No one else will have a Hoody quite like yours. Kids, Babies & K9s are made of high quality vintage soft thin fleece material. My order arrived today, and it was like receiving a box of sunshine! I love the vibrant, joyful designs on all the pants, hoodie, and towel. Many, many thanks. I'll send a pic as soon as I can figure out what my kids did with my iPod.